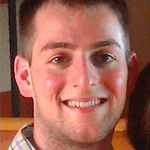 Meet Josh Heinsheimer, a happy DAT Bootcamp customer who recently conquered the DAT. I’ve asked Josh to share his DAT experience with us as the featured student of November. It cannot be said enough that the DAT is a marathon and not a sprint. While I am sure it is possible to study over winter break and take the DAT between semesters, I would not have performed well. Every single section on the DAT can be improved through practice; your score is predicated on the effort you put in. 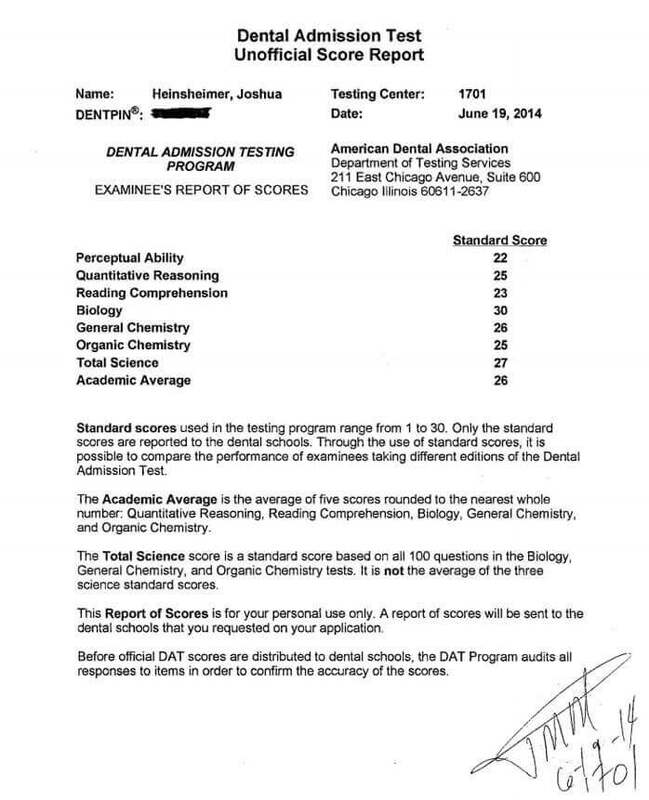 I firmly believe that the DAT is not a measure of intelligence, but instead a measure of how hard you are willing to work to gain entrance to dental school. The only way for the average student to master the voluminous material of the DAT is to chip away at it over many months. I reviewed over winter break, studied through spring semester, and then dedicated a full month to practice tests at the start of the summer. I think the key to my success was that I took handwritten notes on any problems I got wrong, any formula I had to use, and any information in the solutions that I was fuzzy on. I would note any incorrect problems, and then repeat them the next day and then again after a few weeks. By the end of this process I had many pages of notes, about 50, and I write magnifying glass small. I think the biggest trap students face when preparing for the DAT is that they get a problem wrong, hopefully look up the needed information, but then assume that they will remember whatever they just looked up. Let’s say you remember 75% of the information you look up, and that’s probably generous. Then in 2 months you have forgotten 25% and just wasted all that time. By keeping track of everything you get wrong in one place, you are able to revisit the information repeatedly and remind yourself of your areas of weakness. You many even start to see a pattern, and then know where to focus your studies. I used Bootcamp in my final month of studies to push myself. I used Destroyer, DQV Bio/GC, AP Cliffs, Bootcamp Bio Notes, and Crack DAT RC/PAT to prepare me for full-length exams. 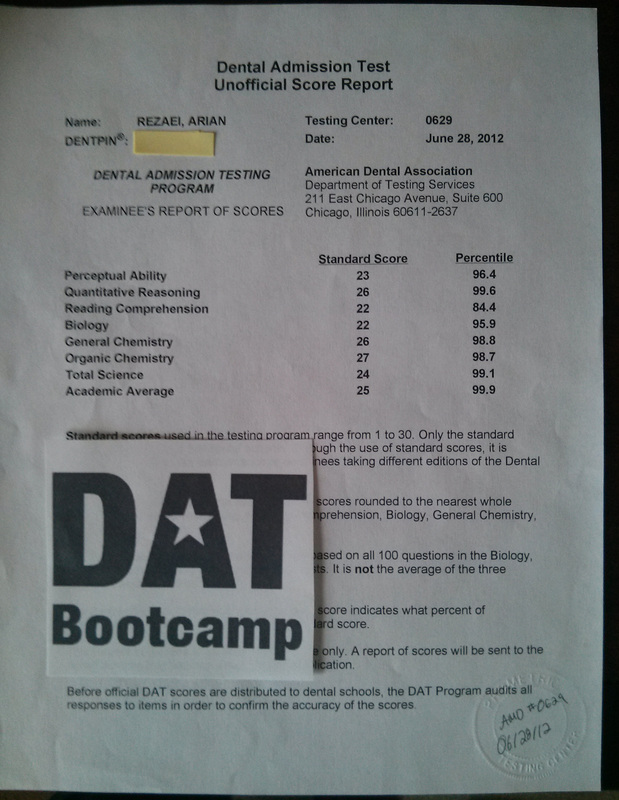 Then I used DAT Bootcamp and Topscore to simulate the DAT. I would take a full-length exam one day, then review the exam the following day. Again, I took notes on any problem I got wrong or any information in the solutions that I was fuzzy on. I would review the notes right before I went to sleep and would also revisit the material weeks later to keep it fresh. Finally, about a week before D-day, I took my notes and consolidated them. I marked any information that I didn’t know and made about a 2-page sheet of things I still needed to memorize. By the time of my exam, there was not a single thing I had noted that I didn’t know. DAT Bootcamp PAT is a must. I recommend taking DAT Bootcamp PAT tests, then reviewing all the keyhole, TFE, and folding problems many times. Eventually, you start to get a feel for the tricks of the trade and by the 4th PAT test you will wonder why you used to think this section was so hard. One piece of advice, don’t worry about your practice test scores until the very end. I scored 17-18 for my first 4 Crack DAT RC tests and I couldn’t finish a Crack DAT PAT without getting a headache. It’s OK! I didn’t take a timed practice PAT until my 6th CD test and I didn’t even finish that test. Your scores probably won’t improve for a few weeks if not more. Try not to compare yourself to others on SDN, people post their practice test scores and somehow miraculously get 20+ on their first PAT. Either the force is strong with them, or they failed to mention that they had to work through TFE for like 3 weeks before they could understand what a dotted line means. The PAT takes time; don’t go into this process expecting immediate results. If you have any questions, feel free to contact me on SDN. SDN username: member012. I fancy myself a normal guy. I had to use lots of tricks to get through RC and PAT because those sections can be tough. More than happy to share some strategy with you! My score breakdown: 26 AA, 27 TS, 30 BIO, 26 GC, 25 OC, 23 RC, 25 QR, 22 PAT.